Fall in love with it, do exactly what it mend to do and also as described about this product in the site, its stylish, trendy, very useful, light weight and good battery life. Good deal at a good price. Only con was the packaging was very poor. 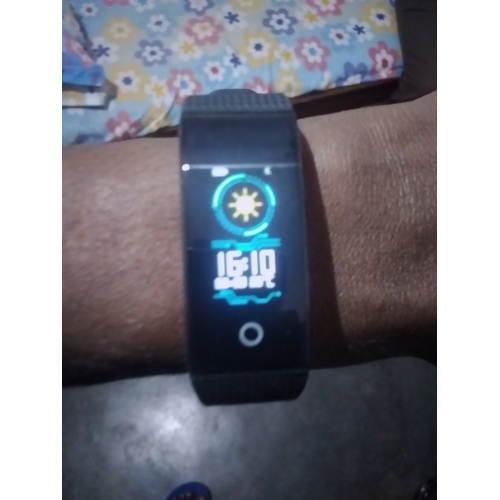 Fall in love with it, do exactly what it mend to do and also as described about this product in the site, its stylish, trendy, very useful, light weight and good battery life. Good deal at a good price. Only con was the packaging was very poor. Dear customer, we are very glad you generously uploaded a picture of smartwatch and shared it with other customers. It will be very helpful for others customers to review the products. Thank you again for taking the time to do it, we really appreciate that. Dear customer, we are very glad you generously uploaded a picture of smartwatch and shared it with other customers. It will be very helpful for others customers to review the products. Thank you again for taking the time to do it, we really appreciate that. Connecting the watch to the phone was quite easy. The language changes automatically to that on your phone, time and date get taken over also. The App is clear designed and easy to use. Just a hint for someone who buys this watch: the device is charged via an USB adapter placed inside of one of the laces, that has to be pulled off. You need some hard pull, because the lace fits really tighly on the device. Good stuff, so the lace cant fall off accidentaly on the first sight i would recommend the watch to my friends. Connecting the watch to the phone was quite easy. The language changes automatically to that on your phone, time and date get taken over also. The App is clear designed and easy to use. 3 montre bien reçues et fonctionnelles. Très bien pour le prix! 3 montre bien reçues et fonctionnelles. Relógio muito bom atende as necessidades só não dei 5 porque eu não sei mexer direito kk está inglês o aplicativo para vincular ao Celular e não dá pra ajustar a hora. Você consegue zerar ele e ele vai para 9 da manhã. Agora sobre a bateria muito boa dura muito e você pode carregar no carregador de celular ou entrada USB do computador. Muito bom	Relógio muito bom atende as necessidades só não dei 5 porque eu não sei mexer direito kk está inglês o aplicativo para vincular ao Celular e não dá pra ajustar a hora. Você consegue zerar ele e ele vai para 9 da manhã. Lindo relógio, mas ainda não testei. Lindo relógio, mas ainda não testei.